carrie - Allison, this is a hard decision but I agree with you 100%, and anyone who has ever had the moment happen that they cannot take back….when their dog attacks their child, I am sure would tell you their continued heart break from the harm or worse to their child. You will find him a good home and he will be loved. BUT no matter what, your babies come first, and you are a wonderful mommy to them already. Taking such good care and showing them love everyday. Hugs on a tough, yet right choice. Aunt Susan - Allison, I so should not have looked at your blog this morning when I don’t have time to cry. Okay, so I am crying! Yes, you are making the right decision, but oh, that is such a hard one. I am praying that you will find a perfect home for him. If I was close, I would take him…..but then I have a gift for taking stray or have-to-give-away pets. Hope the joy of waiting for the twins to arrive will outweigh the sadness of parting with sweet Max. Love you both!!! Hubs - ……..and just teared up at work! Nellie Coleman - That’s so funny – I was going to say you look way bigger in your April self portrait! lol! Dad - I know what you mean. He has been a great dog and I will miss him too. That dog has been a fun one to see grow up and be trained so well by you and Grant. And I just laughed and laughed at his “howling” picture as it made me laugh too! Melissa Jill - Crying for you, friend. I can imagine this is SO hard for you! I’m so thankful though — after reading your FB post, I thought you were having to put your dog down. I’m so glad he’s at least ok and headed to a new home. But I’m sure this is devastating for you. I can’t imagine having to say goodbye. Praying you will lean into the loving arms of The Great Comforter today. Hugs and tears…. 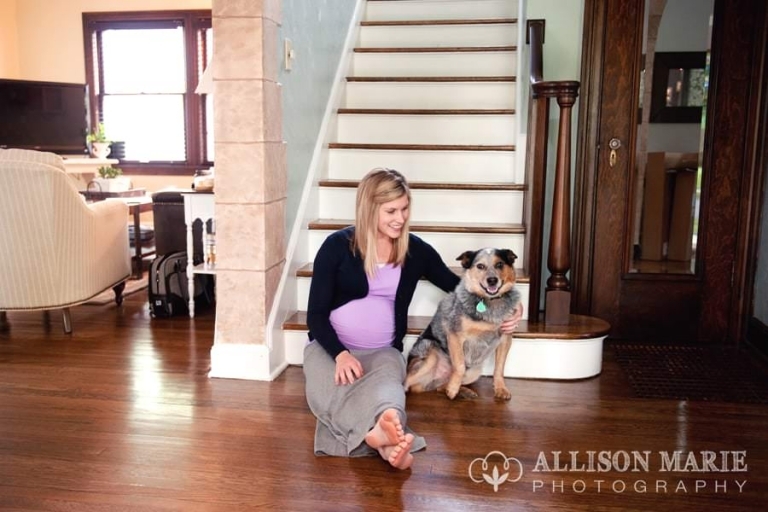 Lainy - I absolutely love the updates on your pregnancy! I’m having twins too – due in November! The doctor told me I had to gain about 40 lbs which I feel is enormous. :( What did your doctor say??? Allison Marie - Hi Lainy, thanks for commenting! My dr. isn’t too concerned with my weight, as long as the babies are growing, so she didn’t give me a certain recommendation. I do have a feeling it’s going to be hard to put on ONLY 40 pounds, though! It is super scary to think about, but I just have to trust that my body knows exactly what it’s doing for the babies’ sake! :) I hope you’re feeling well! Jacinthe - Allison, you look absolutely beautiful – as always! I bet Grant smiles every time he looks at you and your cute baby bump. ♥ :) These pictures are great! Loving the skirt you made – it looks awesome on you. Looking forward to your next pregnancy update/self-portrait post!! Allison Marie - Jacinthe, thanks so much!! Next pregancy update will hopefully be this Monday! Allison Marie - Today, actually!! BTW, enjoy those walks while you can! And I’ve been meaning to (re)share this What I’m Loving post with you. ALL of these things here are my go-to pregnancy recommendations but knowing how much you love fitness too, I cannot recommend enough these workout DVDs! The best thing about working out while pregnant was knowing I didn’t have to push myself to the point of exhaustion or beat myself up over missing a workout…that it was all about just building up stamina for birth and new motherhood. Oh, and that stretch oil? I LOVED IT! Stephanie - Beautiful story! Love the idea of a prayer while crafting! Haley - Allison, I dare say I’m now an expert in this area. But I do vote you should paint if the stain rubs off! That’s a sign that they would likely be easier to clean, sand and repaint than others! Mine hadn’t been touched in 30 years and were covered in grease. I would recommend you sand them down with a hand sander since the stain was done wrong the first time and might be loose to begin with, use liquid deglosser in the creases for the remaining stain. Then use 1-2 coats of primer like KILZ so the old stain doesn’t leak through and 1-2 coats of your paint color of choice! White sounds awesome, but of course I’m partial. Dusty blue would be beautiful too! I will say it’s a bigger job than I wanted it to be, but it was absolutely worth it! Rachel Farley - Love your kitchen! I say go for it! We are thinking of doing ours as well, they are currently oak. I have heard from two people, who do things like this lots, to use Sherwin-Williams paint because it covers so well and fills in the grain. Search Pinterest and makes those babies yours! Jamie DeWitt - I honestly have no experience with cabinet painting or staining but I love the look of white cabinets in a kitchen. I love how clean it looks and how it truly goes with anything, making adding an accent color easy or just keeping different neutrals. I follow this blog called naptimedecorator.com and she has some cute ideas. She painted her kitchen cabinets white last year. Anyway, hope it all goes well!! Courtney - Oh this photo is darling! And I LOVE all three color options you listed. I’m kinda thinking the light dusty blue might be SUPER gorgeous and fresh and clean looking. I’ve never painted kitchen cabinets but I’m sure you could find some really good tips if you google it. Wish I was close by and could help you paint! Gail - YEAH for year 3 of portraits! As for painting your cabinets, I’ve never done it before but my sister has … a KEY step will be making sure to prime ’em! Knowing your creativity, you’ll have that place looking SUPER amazing in no time!